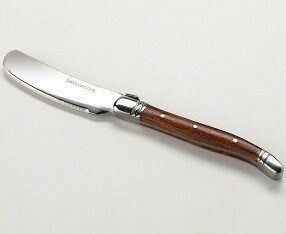 A lagiole style butter knife with a rosewood handle and our logo on the blade. A beautifully crafted lagiole style knife with a lacquered rosewood handle and a stainless steel blade, with "Paxton & Whitfield" on the blade. Not suitable for dishwaher use. The knife is approximately 17cm in length.